LBJ Arm-Twisting? Not Really Obama's Style To push a health care overhaul through Congress, politicos — and even the White House — have suggested that President Obama look to lessons from LBJ, the silver-tongued master of political compromise. But strong-arm tactics aren't Obama's thing. 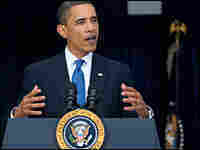 President Obama has stepped up his engagement in the effort to overhaul health care. 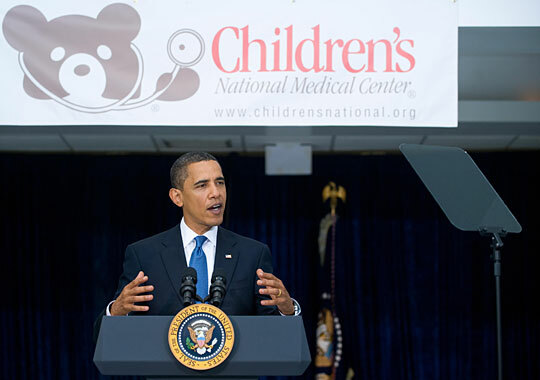 Above, he addresses the topic during a visit to the Children's National Medical Center in Washington on Monday. The conventionally wise in Washington maintain that President Obama is at a crossroads. In order to push legislation through Congress, the thinking goes, the current president will have to use a cagey combination of arm-twisting politics and silver-tongued compromise a la Lyndon B. Johnson, the past master of both approaches. The Senate is reportedly making bipartisan progress on passing Obama's landmark legislation that would retool the nation's $2.4 trillion health care system. But some of the party's more conservative House members known as the Blue Dog Democrats oppose the House version of the health care bill, as do nearly all the Republicans. In other words, as Newsweek puts it, this is President Obama's "LBJ moment." It's one of those Washington notions that gets racketed around like a shuttlecock for a few days, then either takes hold and becomes a chapter in the history books, or falls apart and quickly fades to footnotes. As Obama also looks to initiate change, Johnson's name is evoked. An early flare was sent up by The Washington Post on July 14 in a story headlined: "On Health Care Reform, Obama Looks to the LBJ Model." Staff writer Ceci Connolly reported that Obama's team is using the same legislative strategy used by Johnson to promulgate Medicare in 1965. "There are two qualities these presidents have in common," White House senior adviser David Axelrod told Connolly. Johnson, like Obama, "had a big vision and drove the country toward it; and second, he had a great appreciation for the legislative process." By choosing to speak about the parallels, the administration opens Obama up to comparisons and criticism by historians and critics. Obama, says Julian Zelizer, a political historian who teaches at Princeton University, "does need a little LBJ in him." Johnson A 'Tainted' Model For Obama? There are snags in expecting Obama to act like Johnson. For one thing, by the time Johnson became president in 1963, he had decades of experience in Congress. Obama began seeking the White House not long after winning his Senate seat in 2004. Plus, the two men "are pretty far apart in most people's minds, and certainly in [Obama's]," says Ted Widmer, a fellow at the New America Foundation, a Washington-based think tank. Between 1997 and 2001, Widmer served in the Clinton White House as a foreign policy speechwriter and senior adviser to the president. One of Obama's salient campaign promises was to bring an end to politics as usual in Washington. And no one was better at the usual politics than Johnson. The main reason for Johnson's successful legislative maneuvering, writes Samuel P. Jacobs in the Daily Beast, "was his capacity for understanding the nuances of Congress, knowing what buttons to push to make members of both houses step in line. Obama, so far, has received the most praise for his ability on stage, not in the backroom." Johnson as role model for Obama poses other problems, as well. Presidential historian Allan Lichtman, who teaches at American University, points out that "despite his mastery of the legislative process and enormous harvest of domestic legislation," Johnson is "a tainted example because of Vietnam." Lichtman and others also suggest alternative role models for Obama — former presidents who knew how to negotiate the shoals of Congress yet didn't get mired in bad choices. Perhaps the best beacon would be Woodrow Wilson, Lichtman says. "Wilson was a major legislative craftsman, with deep knowledge of how Congress worked from his studies as a political scientist. He revived the tradition, dormant since Jefferson, of giving the State of the Union speech in person to Congress as another means of outlining and pushing his agenda." During this first two years, Lichtman says, "Wilson succeeded in reforming the protective tariff, establishing the Federal Reserve System. He gained passing major antitrust legislation, a graduated income tax, and limitations on the use of court injunctions against labor unions." Franklin Delano Roosevelt "is still a classic model," says Zelizer. "He found ways to broker deals in a very divided Democratic Party. He constantly flooded Congress with a lot of proposals to keep momentum alive. He never had any downtime." Roosevelt was masterful, Zelizer says, at "living with what was possible instead of what was perfect. For many liberals, this was frustrating." By using that strategy of relentlessness and occasional compromise, Zelizer says, Roosevelt was able to push through social safety-net legislation. "It paled in compared to Europe's social security plan," he says. But it was pretty progressive for the American system at the time. Zelizer does say that Obama needs to avoid the pitfalls of Johnson. And of Jimmy Carter. "President Carter had more trouble working with Congress," Zelizer says. "He had no relationship with Capitol Hill." In the end, Zelizer says, Carter was "too esoteric." He had great vision when it came to a national energy policy or the SALT II nuclear arms talks. "But he just couldn't put it together for legislation or the treaty," Zelizer says. "He just couldn't articulate his vision." Using his own methods, relying on his own political personality, will Obama be able to sway enough people to get the necessary votes to achieve 1965-style results with 2009 technology? "The jury," Zelizer says, "is still out."